Good water management. A well-designed, professionally installed gutter & downspout system provides protection against erosion, plant dama, e and basement flooding. The experts at Scholar Painting can install quality gutters that will provide effective roof drainage year round! Contact us today to get a free estimate on new or replacement gutters and downspouts throughout the Greenwich, Darien, New Canaan area! If you're planning to replace old gutters and downspouts or install a new roof drainage system, one of your first decisions will be the material used for gutters and downspouts. Here are some details about the different choices of materials for gutters and downspouts. Another decision you'll have to make concerns the profile or cross-section of your new gutters. Gutters installed in a "K" profile feature a curved front edge. The "K" or "Ogee" gutter profile is compatible with many house styles. Gutter size is also an important decision. The size denotes the measurement across the top of the gutter. Most houses require either 5-inch or 6-inch gutters. 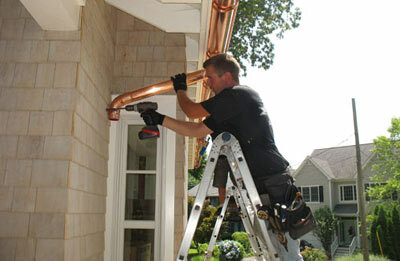 The downspouts used in a gutter-and-downspout system can have a rectangular or circular profile. If you're having gutters and downspouts installed, it makes sense to consider including gutter guards and splash blocks or ground drainage in your installation. Gutter guards or covers will help to prevent your gutters and downspouts from being clogged by leaves, twigs and other debris. Splash blocks and ground drains help to direct water from downspouts away from the house. 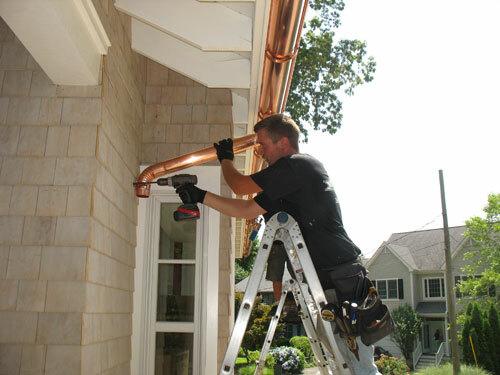 We are your trusted resource for gutter installation and roofing services in Old Greenwich, Riverside, Weston, Stamford, Cos Cob, Wilton, Westport, Ridgefield, Easton, Norwalk, Redding, Woodbridge, Trumbull, New Haven, and all throughout Connecticut. The condition of your roof and gutters can have a significant impact on your home. Whether you are installing gutters on a new home or replacing your old, worn-out gutters or roofing system, make sure you choose an experienced roofing contractor who you can depend on to get the job done right. Contact the roofing and gutter experts at Scholar Painting by calling 1-855-234-8952 or fill out the online form for a free inspection and estimate!